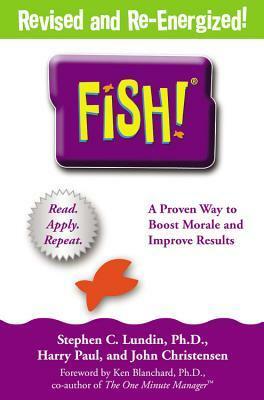 From Goodreads ~ Here's another management parable that draws its lesson from an unlikely source - this time it's the fun-loving fishmongers at Seattle's Pike Place Market. In "Fish!" the heroine, Mary Jane Ramirez, recently widowed and mother of two, is asked to engineer a turnaround of her company's troubled operations department, a group that authors Stephen Lundin, Harry Paul, and John Christensen describe as a "toxic energy dump." Most reasonable heads would cut their losses and move on. Why bother with this bunch of losers? But the authors don't make it so easy for Mary Jane. Instead, she's left to sort out this mess with the help of head fishmonger Lonnie. I've read this book a couple times over the years ... the last time was in 2006. Gord and I were talking about Pike Place Fish Market a couple days ago for some reason (he hadn't heard of it) and it inspired me to read the book again. Mary Jane is a widow with two young children. She recently got promoted to manage a department in the company she works for which is known as a toxic energy dump. She can't afford to quit her job and her manager threatens to fire her and the team if they don't turn things around. Though Mary Jane and Lonnie's story is a parable, they are good principles to live by. Reading this book again reminded me of them.